Minimize safety hazards: Problems like loose carpets, spills, throw rugs, raise doorway thresholds and sturdy handrails can all be safety hazards in the home that can lead to falls or patients getting hurt. It's always a good idea to wipe up any spills immediately, ensure that all handrails are sturdy, remove raises in doorways and fix carpeting to avoid potential danger. Update the bathroom: This room holds many safety issues because it's often wet or slippery from showers, baths and hand washing. 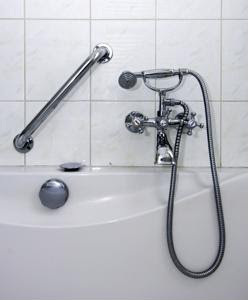 To make the bathroom safer, you can install handles by the toilet and in the shower, put non-skid mats in and outside the tub and to help your patients feel more at ease while using this space. Simplify daily activities: Another way to make the home safer is to simplify everyday tasks, so you can help seniors move items to lower shelves for easier reach, get them a phone with large numbers to easier visibility, install a rubber cap on a cane or crutches for slip resistance, replace worn soles on shoes, keep medications easily accessible with a list of what's taken when and install bright lights throughout the home to ensure good visibility.